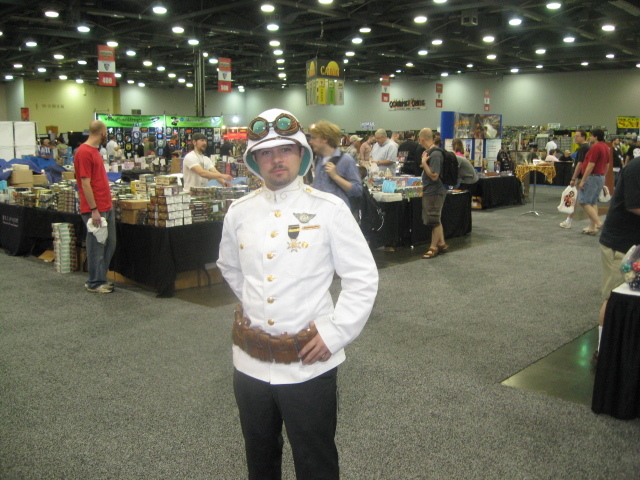 Cosplay is always one of the big attractions at scifi and gaming conventions, and Origins is no exception. 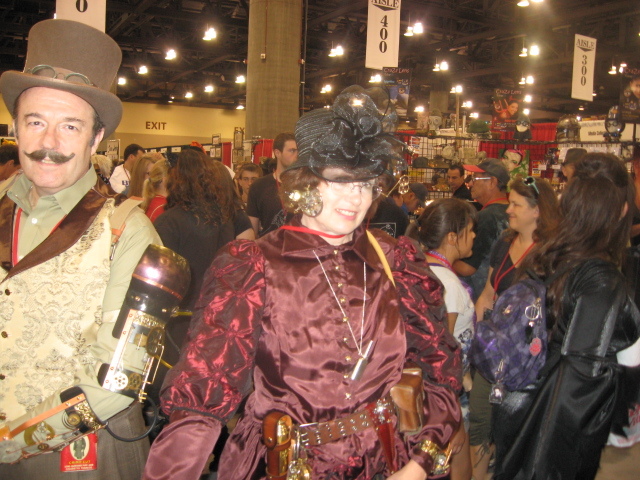 There were some fine costumes again this year including some outstanding furries, but the most prevalent were the Steampunk outfits from an alternate Victorian universe. 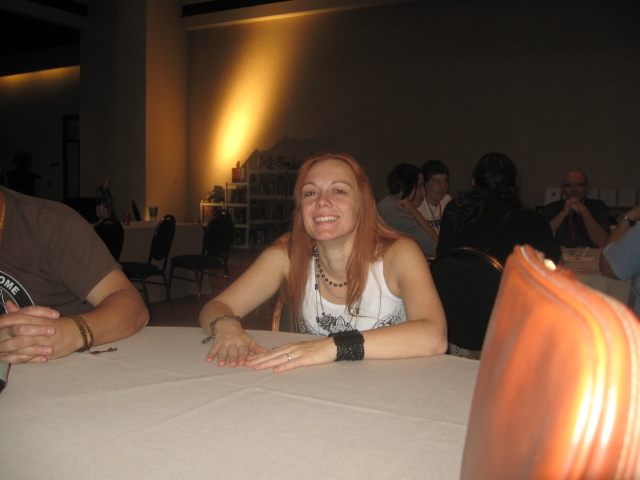 While I couldn’t get pictures of all of them, I did take several pictures, and I’m here to show them to you. 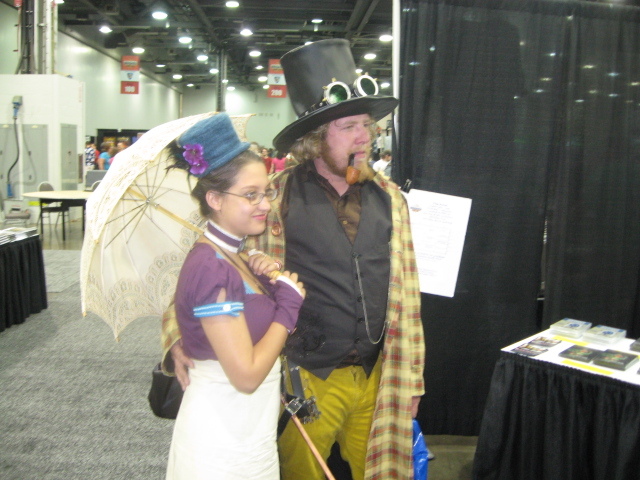 I envy these people, and wish I had something besides an old battered fedora to wear to the cons. 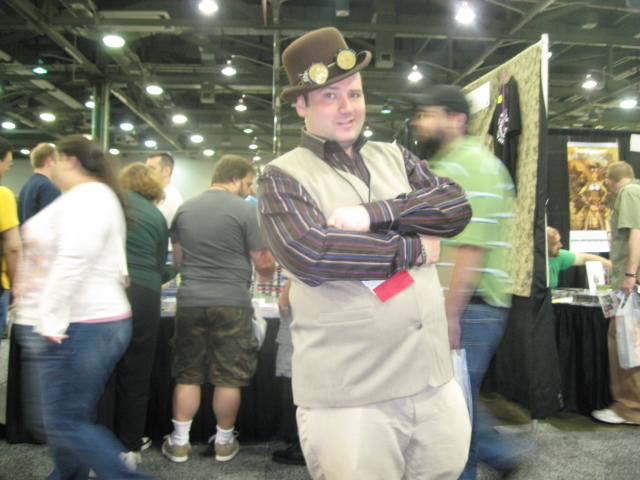 Maybe if I would loosen up and spend some money, I too, would have some steampunk finery to show off. 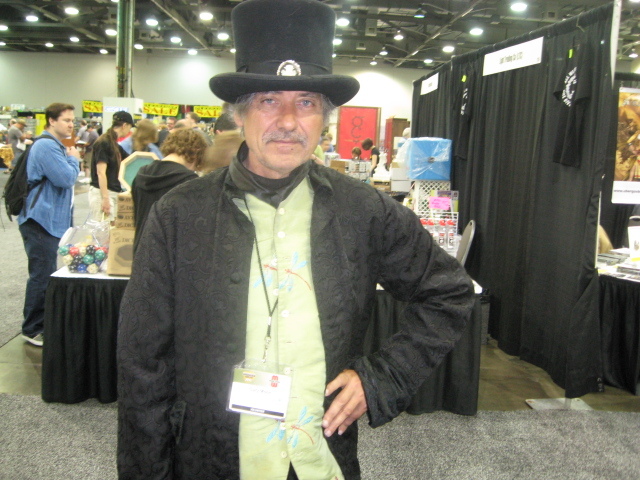 This handsome gent had the booth across from ours (Flying Buffalo). 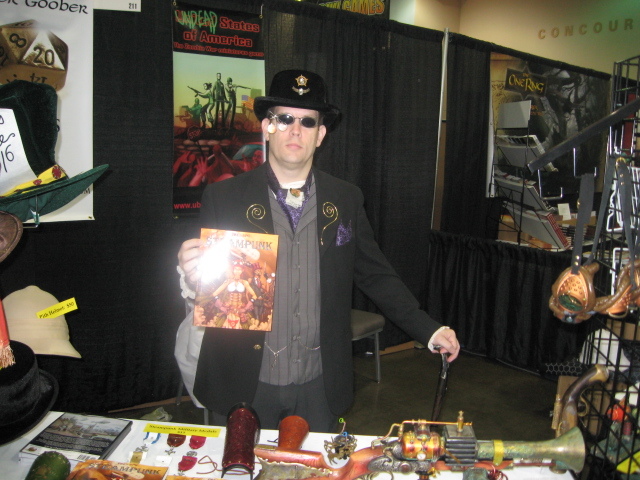 He sold hats, weapons, and a Steampunk role-playing game. Many handsome couples were shopping for games. A gentleman can hardly venture out without vest and goggles. 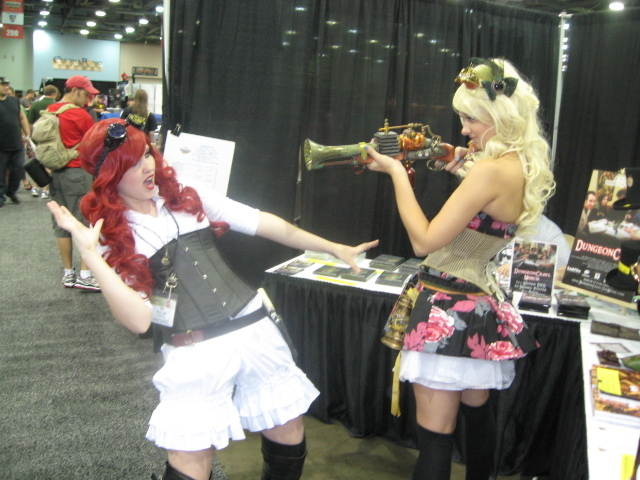 Steampunk ladies don't always need male escorts. Top hat and vest, all one really needs to be in fashion. An ossifer of the crowne. How fine a thing--to squire an elegant lady around Origins Towne. Gary Wolf, storyteller and sharp dresser. Glub, glub!? 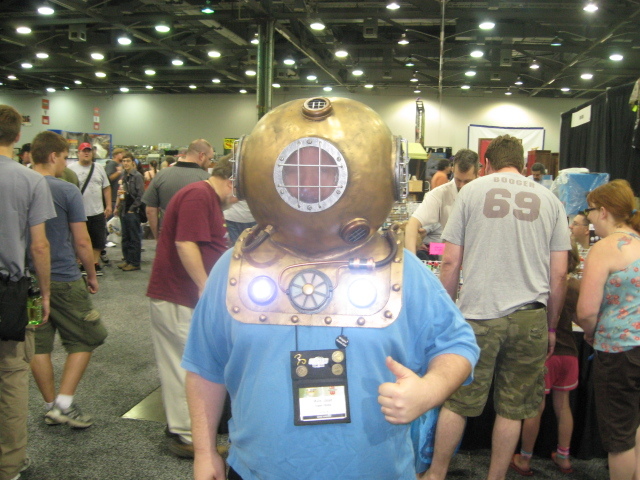 It's a crazy mechanical headpiece. Even trimmer. Never too young for a corset. I will gladly pay you Tuesday for a hamburger today! 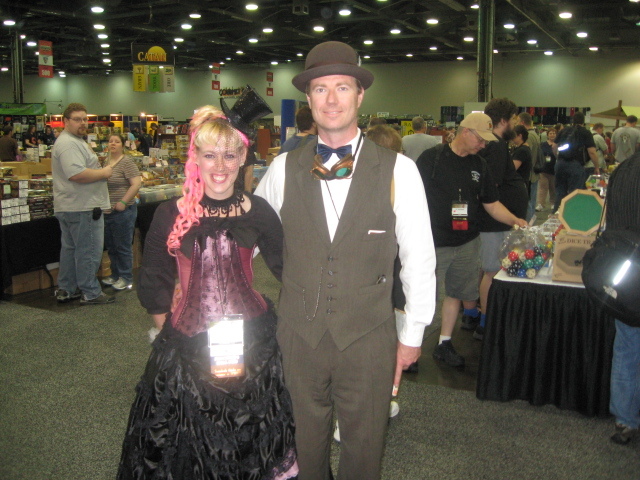 And that brings me to the end of the Steam Punks at Origins. They certainly were a well-dressed crew of scoundrels, gentility, and reprobates. Long may they flourish, and more power to them! I’ve been friends with Terry Lee Ballard for a very long time, since early college days at least, and I graduated from college more than 40 years ago. 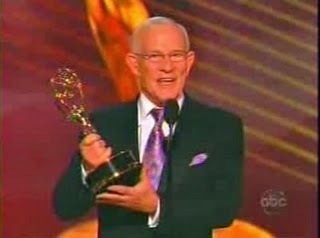 He is the man whose wise advice turned me to a career in librarianship, and that has been a very good career for me. Terry Lee Ballard--librarian, photograjpher, amigo. Decades ago, Terry went east to seek his fortune, and he found it as an academic librarian in New York. From time to time, he returns to Arizona–he still has family here–and when he does we usually get together for a few hours–have a meal, talk about old times, catch up with what’s happening in each other’s lives. Good times! When he called me to set up something for his current trip, I suggested we do a photographic expedition together–Arizona is full of interesting places to photograph. 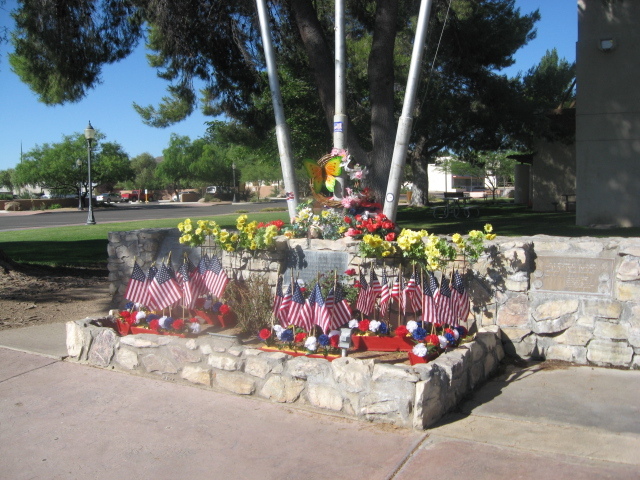 I suggested Wickenburg as a place to go, and he did some research and made a counter-suggestion of a trip past Wickenburg to a hole-in-the-road called Nothing–Nothing, Arizona. 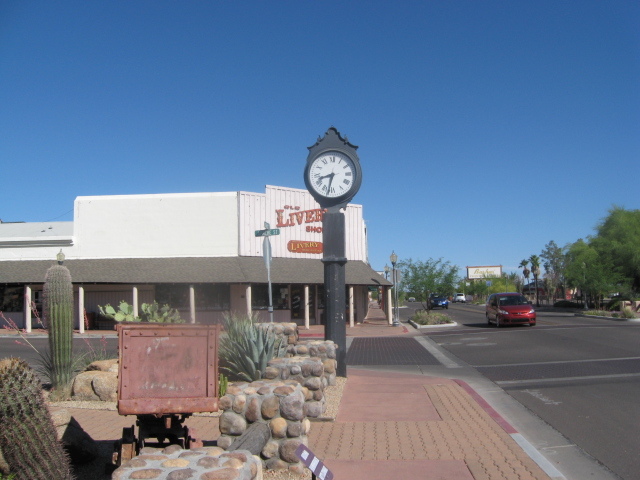 When he arrived at my place yesterday morning, we got into his rental car, and took off for the Arizona desert and wild small towns northwest of Phoenix. The rest of this blog is a photographic record of that journey. He also took photos and should be telling his side of the story in his own blog. Now, to be fair, these two blogs are designed to be a bit of a friendly competition. After you look at mine, please go look at his, and then leave a comment on whatever you like the best. 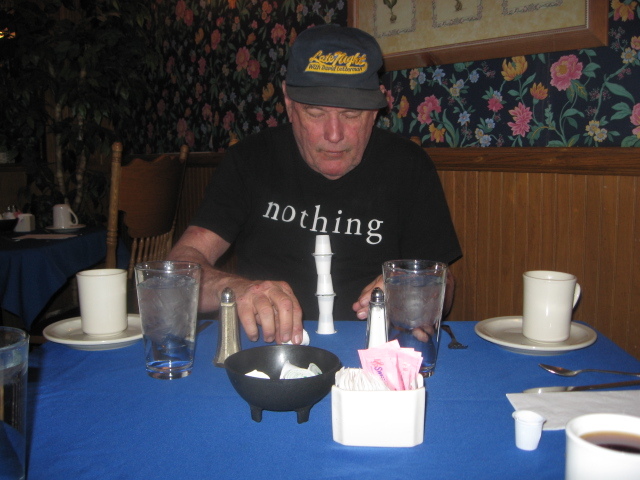 Terry’s blog can be found at: http://terryballard.blogspot.com/2011/06/hometown-blues.html. You will notice that he is much better at integrating words and pictures into a connected flow than I am; however, whatever the reason, I think I got the better pictures on the trip. I really enjoyed the expedition, and hope we’ll get a chance to do it again some time. This was my first photo of the day. How often do you see a horse on the roof of a building? 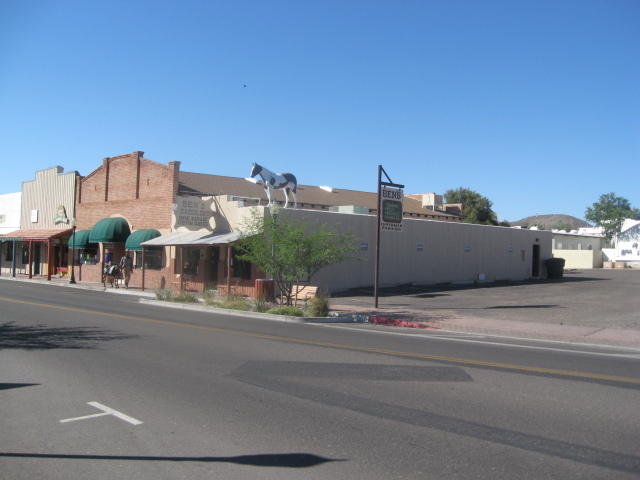 I guess that’s not too uncommon in the West–the Big Apple Restaurant in Phoenix also has livestock on the roof. But you have to admit, it’s not a common sight. The horse is a pinto–a common cow pony type. 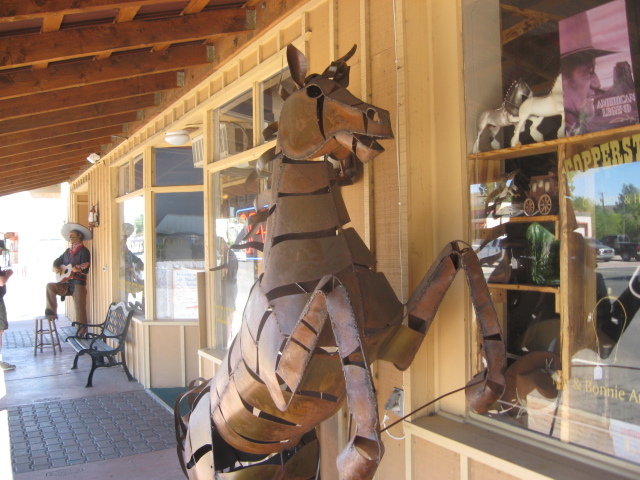 No, it’s not a real horse–just a wooden effigy of one, but it looks good. We got out of the car here and walked around town for a couple of blocks. 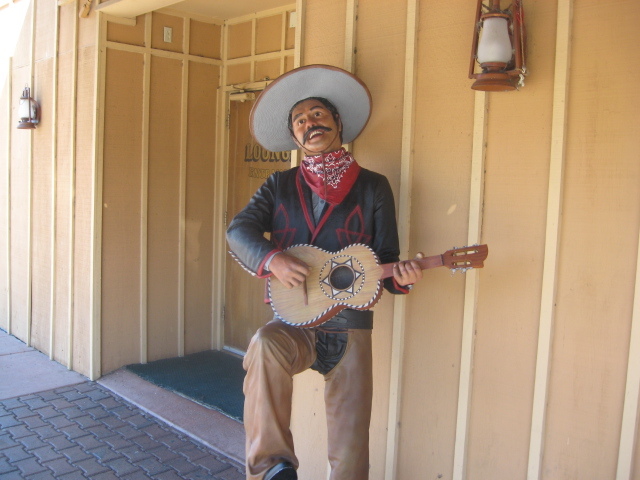 The following pictures were all taken on the streets of Wickenburg. Sun-blasted map. I like the ironwork above it. 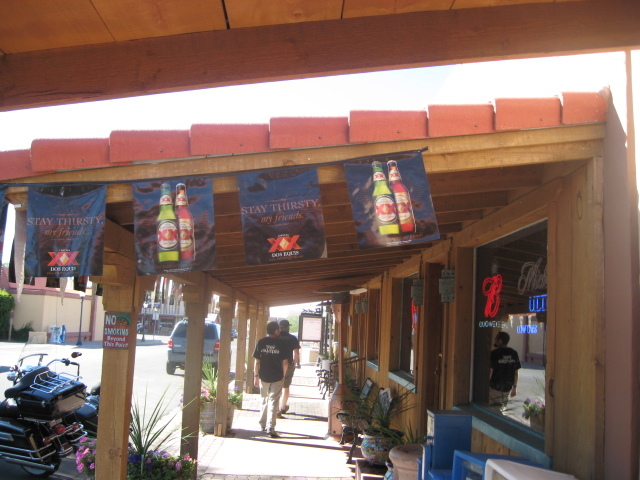 Can you read the beer signs hanging down? They say "Stay Thirsty", and it's an ad for my favorite beer--a Mexican brew called Dos Equis (Two Xs), On the sidewalk ahead of me are my son James and Terry forging ahead in search of who knows what? 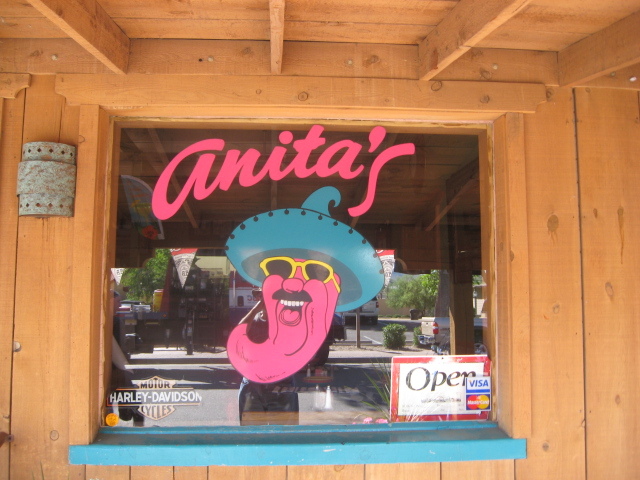 I almost took a picture of the Mexican pots in front of this bar. They were very pretty. I really liked this window. We almost had breakfast here. I kind of wish that we had, although the other place was ok.
Notice the key word “almost”. It turned out the be the best description of the day. Things almost worked out the way we wanted them to. 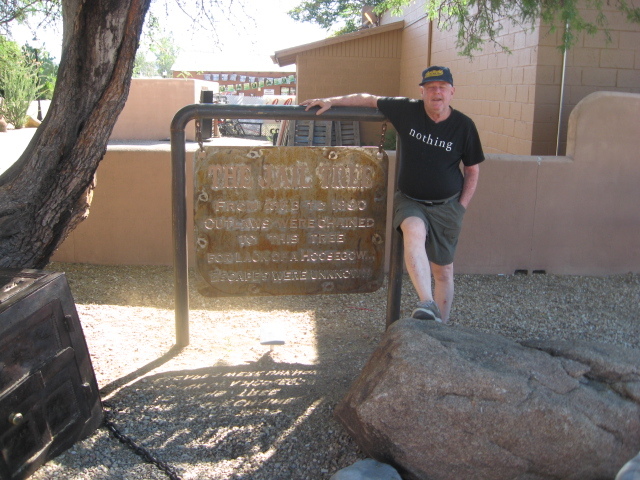 Terry, posing by the Wickenburg Jail Tree. 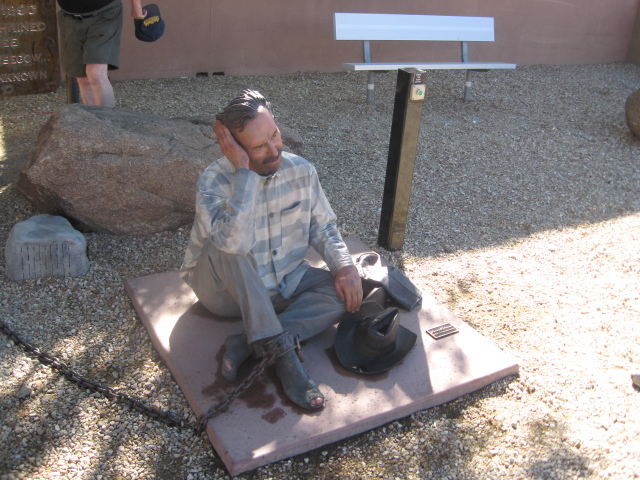 Before Wickenburg got big enough to build its own jailhouse, prisoners of the law might find themselves chained to a tree until they sobered up or met the Hanging Judge. The Jail Tree itself. Such a tree would have to be over 150 years old, and I don't think this tree is that ancient. 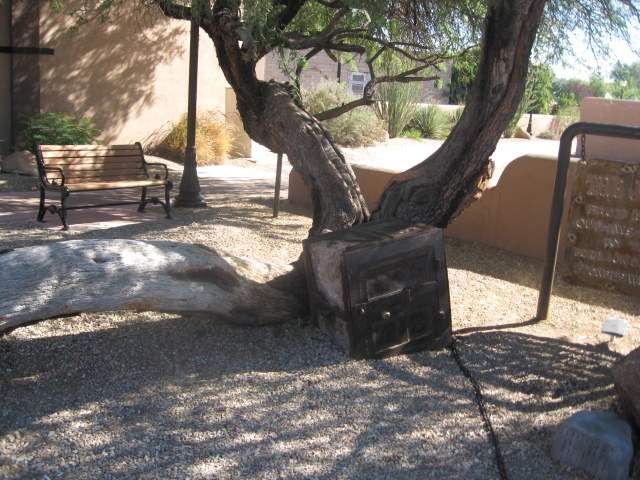 I suspect they made up this story, or maybe this is the son/ddaughter of the original Jail Tree. It's a public clock for people who don't carry watches. Cool store beyond it--I must return to iit some time. 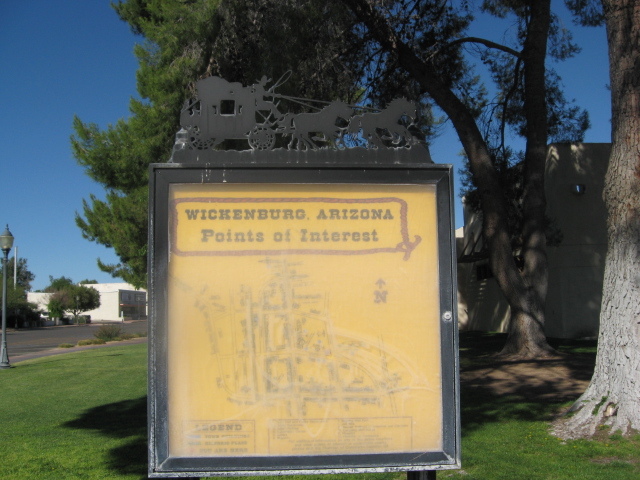 Wickenburg was gold mining country. 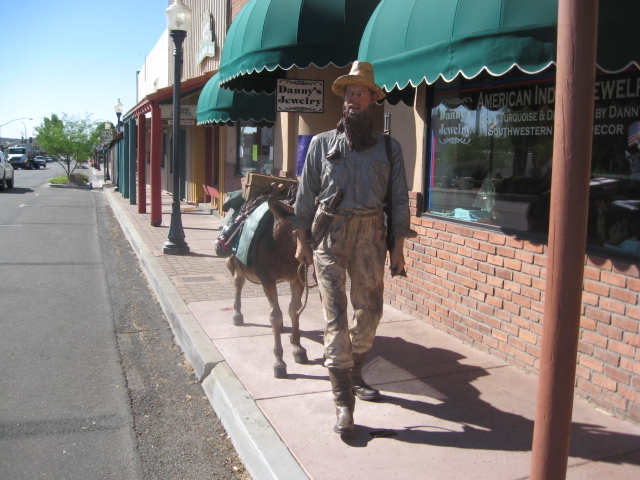 Here's an old prospector, fully provisioned, and heading back out to the desert. You can almost hear the music. Ay ay ay ayyyyyy! Canta y no lloras! High point of the morning--breakfast. My friend is a restaurant architect. Horses are things of the past. This is how today's western outlaws get around. These are some sweet rides. 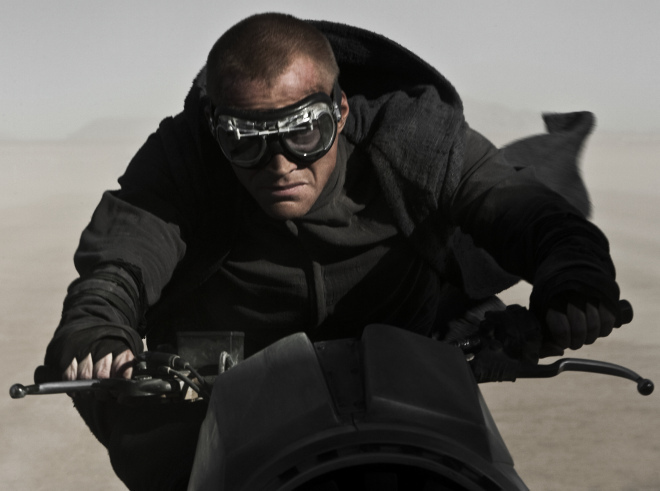 You've heard of the Iron Horse . . . ? The turning-back point. We didn’t find Nothing, Arizona. 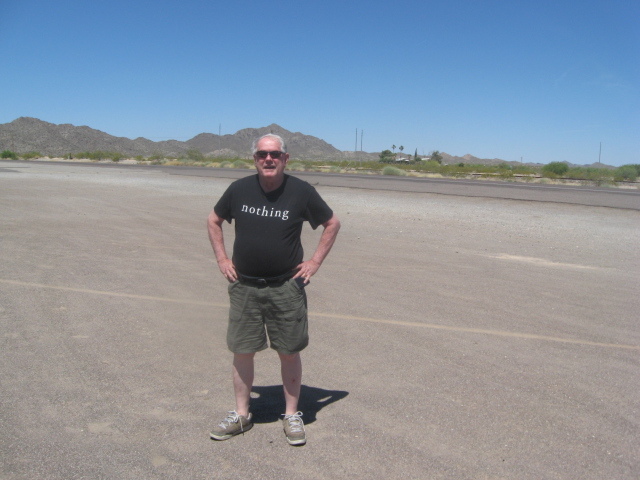 Here’s Terry again in front of Arizona desert. 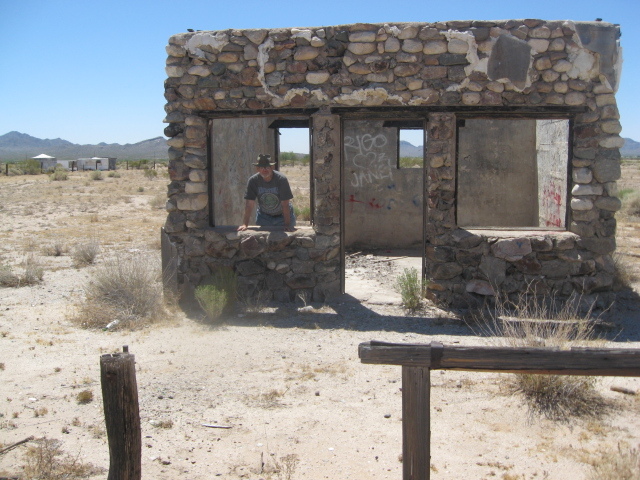 We found this ruin that symbolizes all the ghost towns of Arizona. Desolation, but judging from the graffitti, also the scene of some good times. 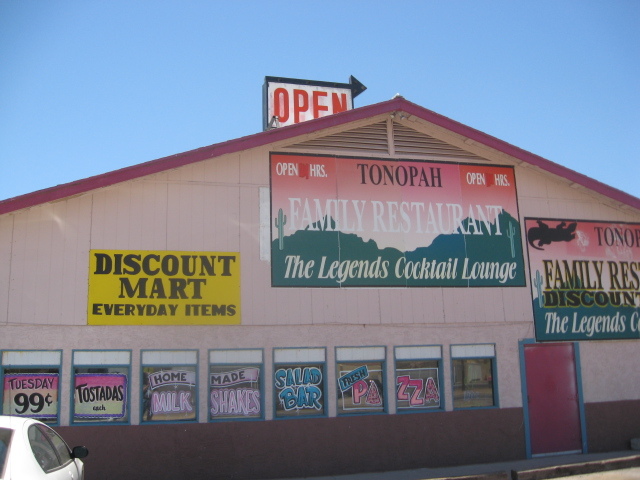 The last picture of the day--a truckstop trading post that symbolizes all the back country of Arizona highway life. Everything you need can be found inside, and a good time when it gets dark. 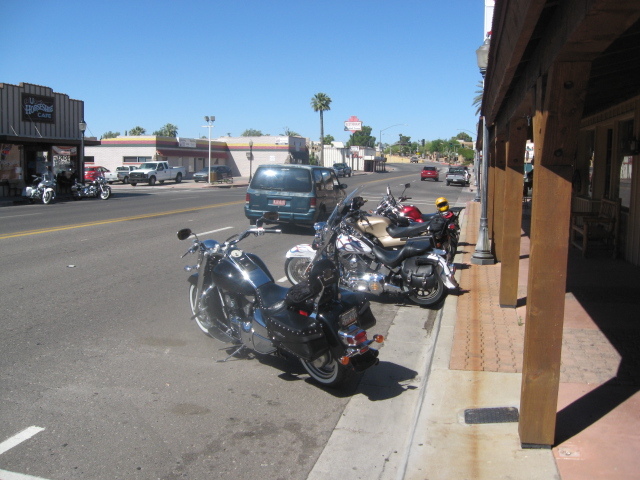 We never made it to Nothing, Arizona–took the wrong turn in Wickenburg. 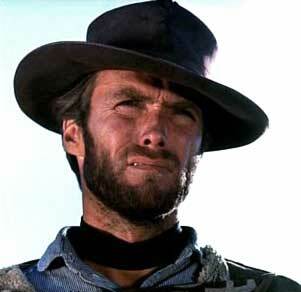 But, we had a good time–a pleasant ride through the desert, a good meal, interesting scenery. Why do I call it a Five Hawk Day? I saw five hawks gliding over the desert during the trip. They have a distinctive look, and I always enjoy seeing desert wildlife in its own setting. When was the last time that you had a five hawk day? 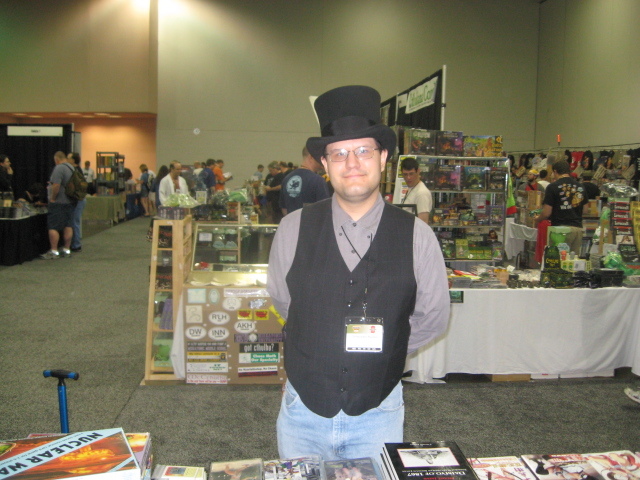 Atroll attended the Phoenix ComiCon 2011 over the Memorial Day weekend. While I was there, running games like Trollhalla and Tunnels and Trolls, I encountered a superabundance of beauty and imagination. 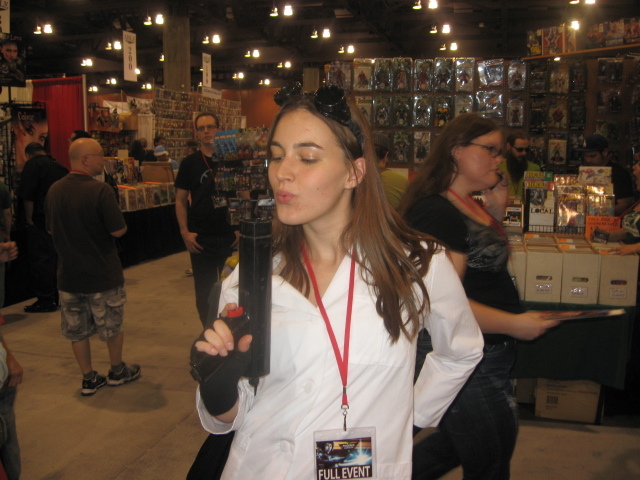 Here then is my inadequate tribute to the Fabulous Women of Phoenix ComiCon. This is Sam. 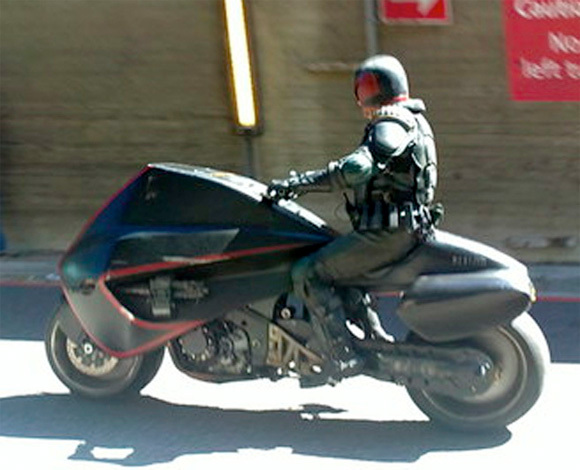 Catwoman never looked so good. 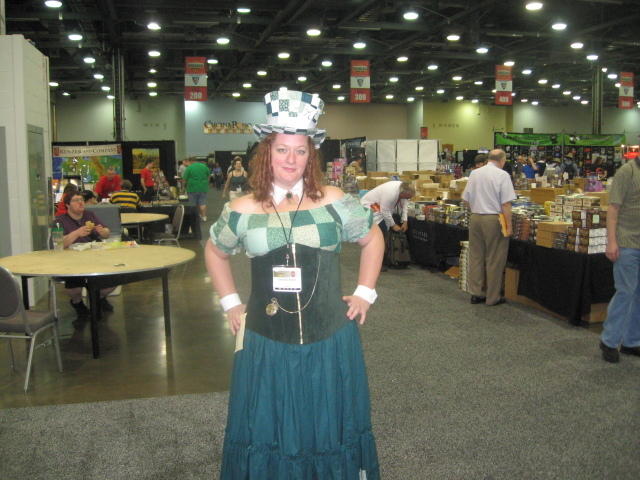 Sam volunteered at Game Central in the gaming area, and was my first model for the Con. 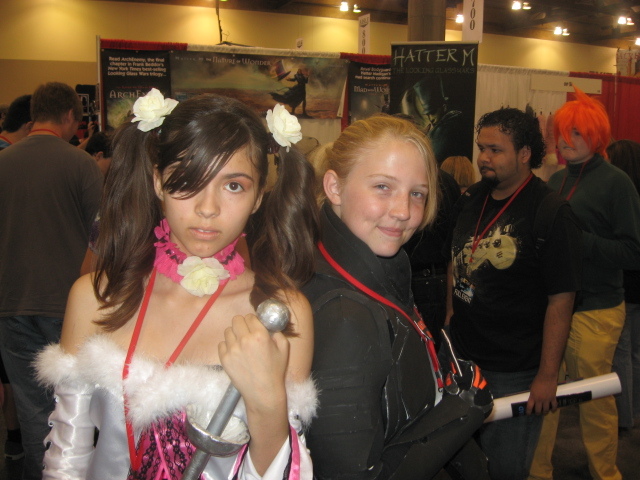 I never got her name, but she was certainly very kind to me and all the other gamers at the Con. 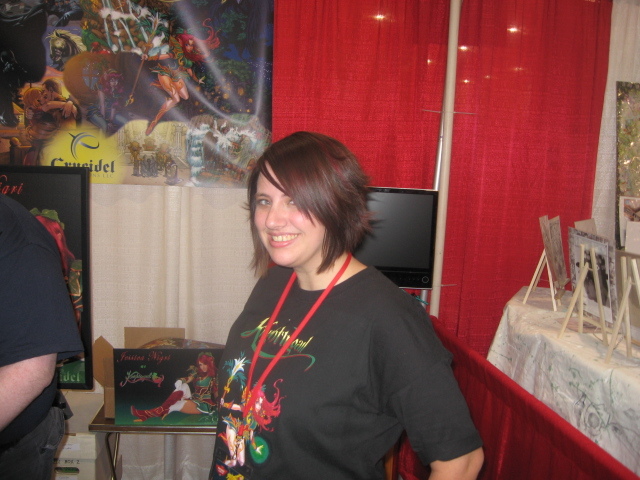 This woman rn games about 16 hours a day--very fun, great sense of humor. More dedicated to gaming than I am, that's for sure. When I left the gaming area behind, one of the first ladies I met was Supergirl. She really looks super, doesn't she? 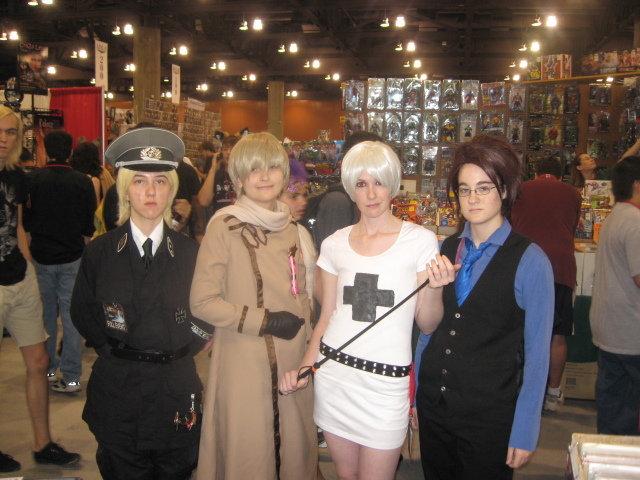 Schoolgirls were at the Con in great numbers. Many of them had an anime or cuddly animal connection. 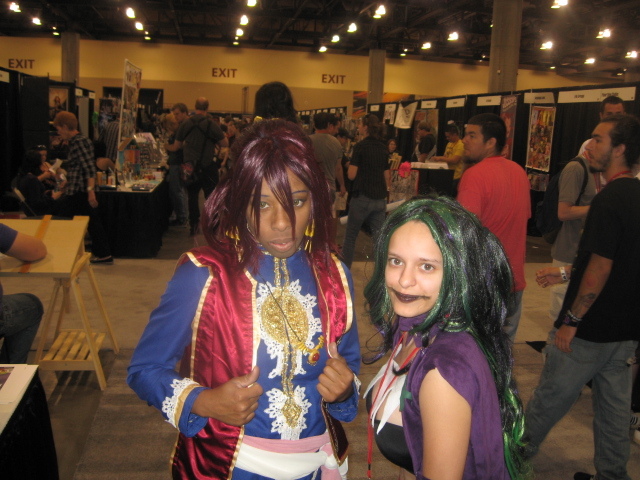 This was just a lovely costume on a lovely girl--one of the vendors. Not everyone was showing a lot of skin and cleavage. 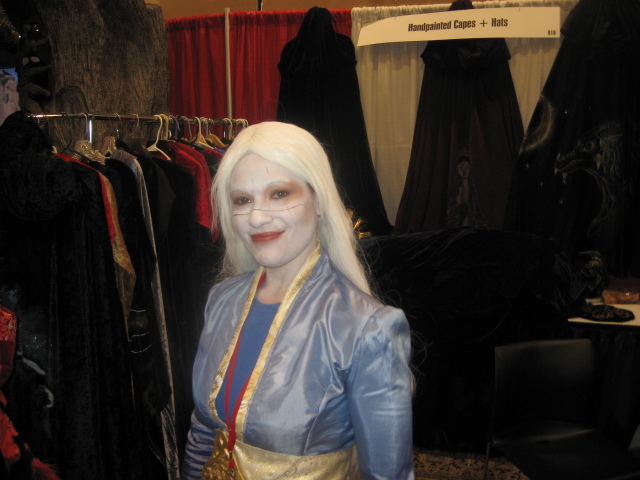 This vendor had such a great smile that I took her picture even without a costume. 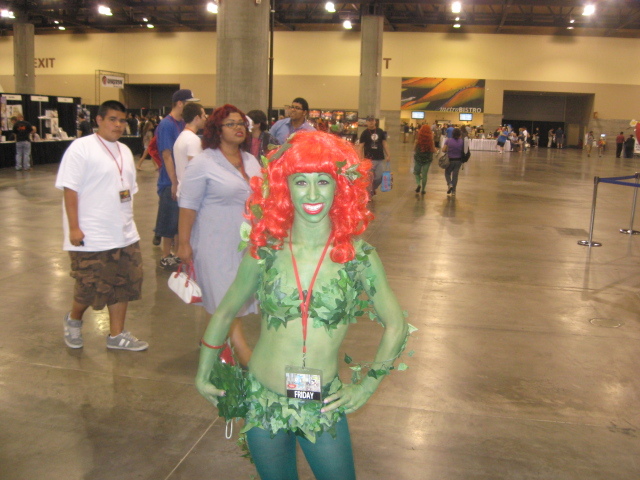 Poison Ivy was surprisingly friendly at ComiCon. 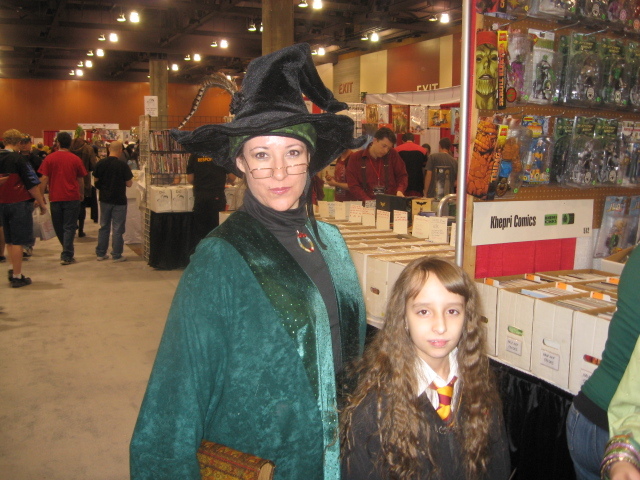 This girl went green for her costume. 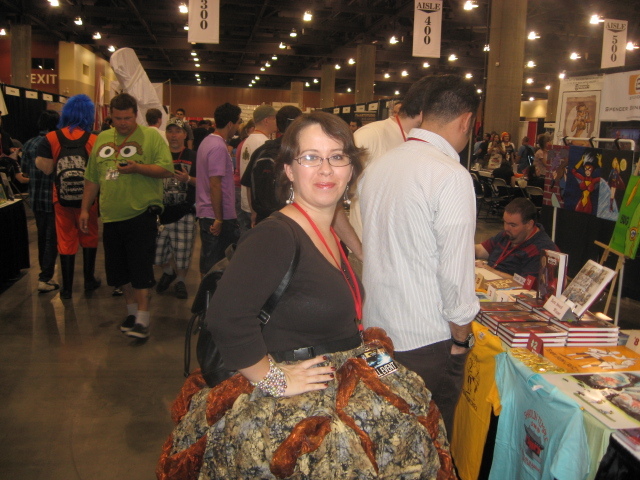 Courtney Leigh is a costume designer, and she is stunning in a dress of her own design. This enchantress can go adventuring with me any time. 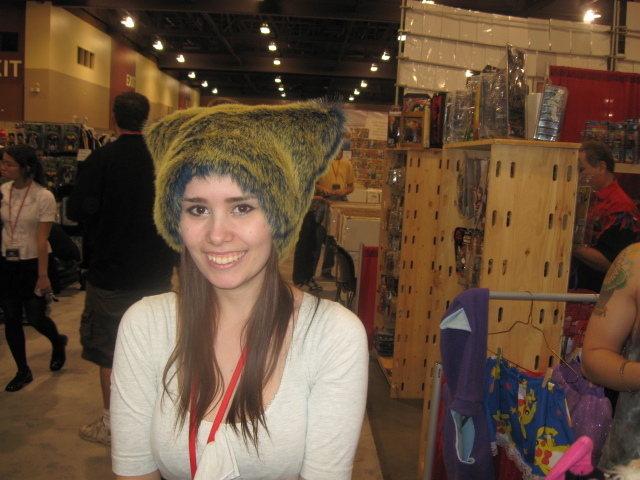 The deadly Princess Lea had some wookie bits to sell. 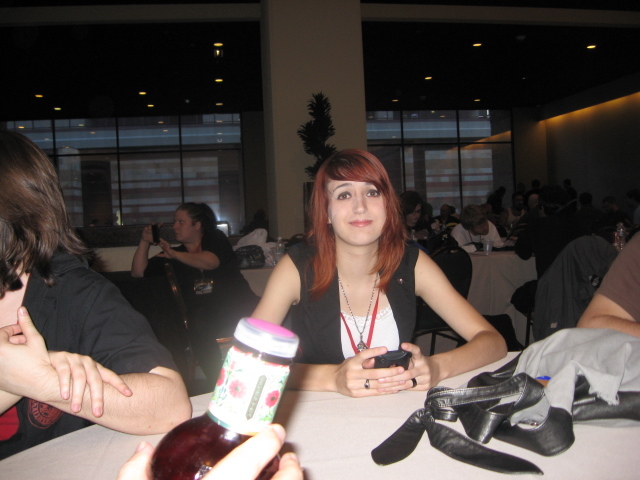 A horla wandered by while I was talking to Lea. 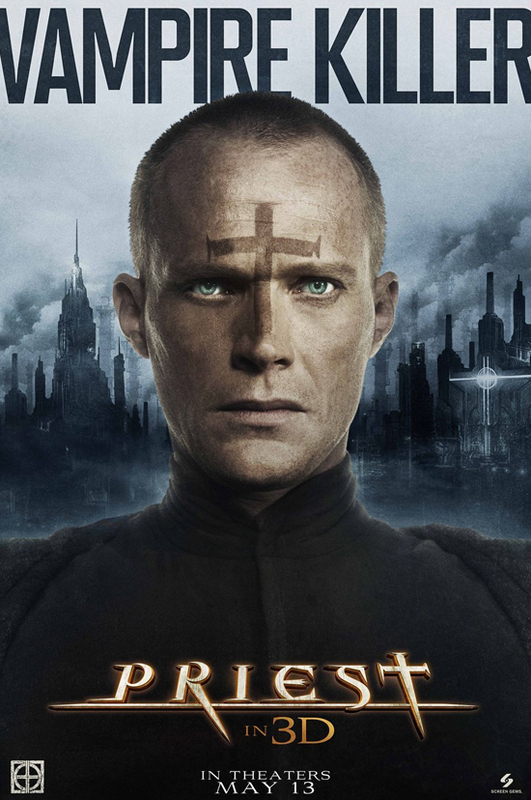 That is a very original costume design. 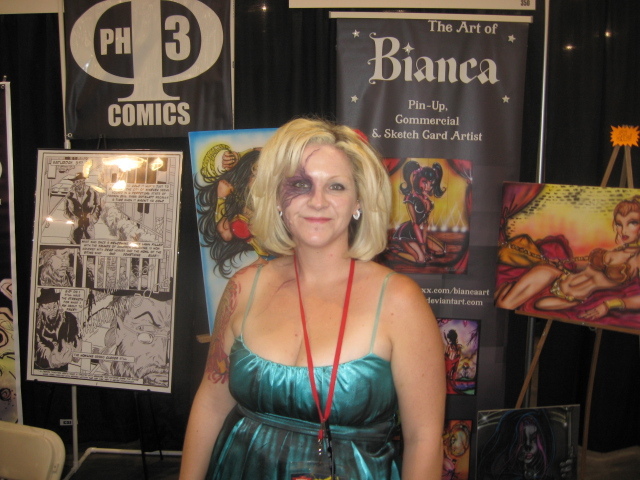 I met Bianca the artist I would love to have her doing material for Tunnels and Trolls, but I have no idea how I'd pay her. 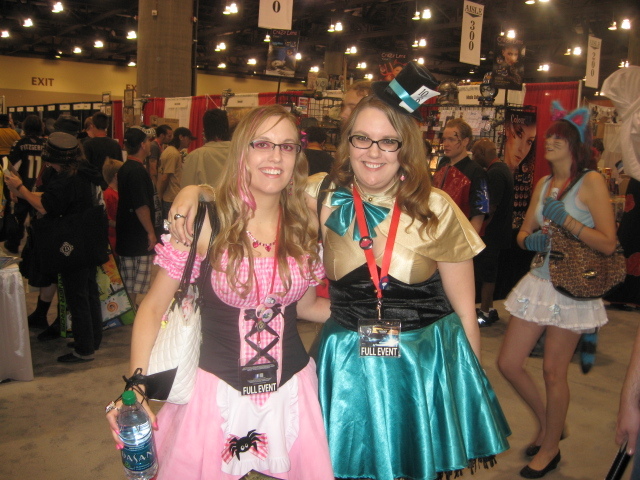 Some girls only needed one cute hat to make a costume. It's a Pokemon, but it sure ain't Pikachu. Ash should get so lucky! 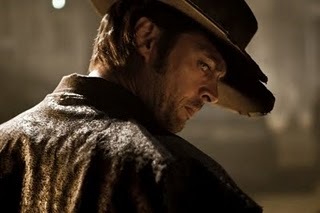 This is where the hats came from. 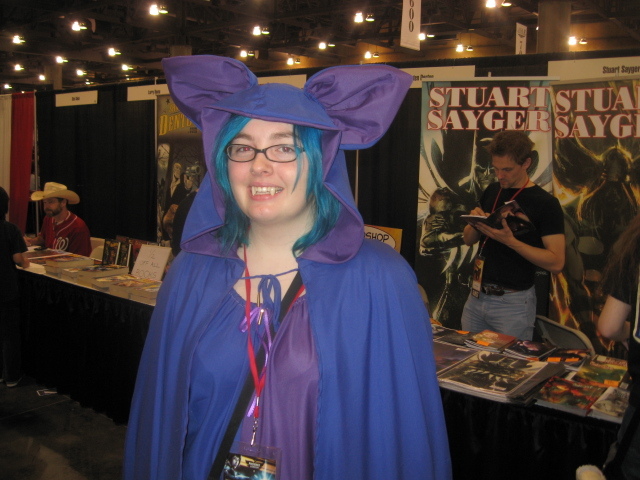 The purple-hatted woman seems to be the mastermind of the group. 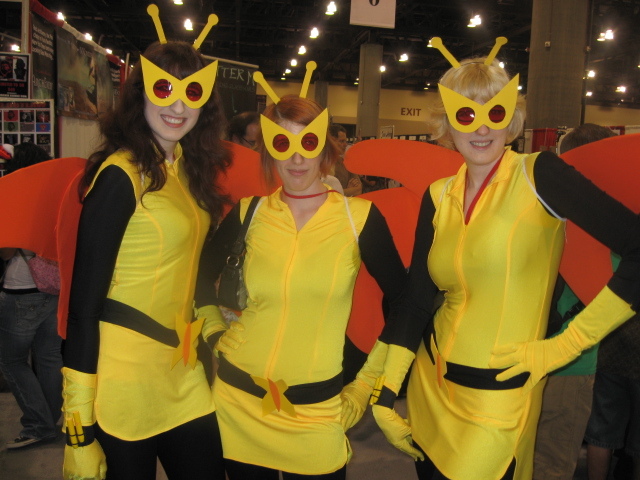 These are not your conventional beauties, but what fabulous costumes they had. I took this picture on Friday. I didn't feel like a zombie until Sunday. 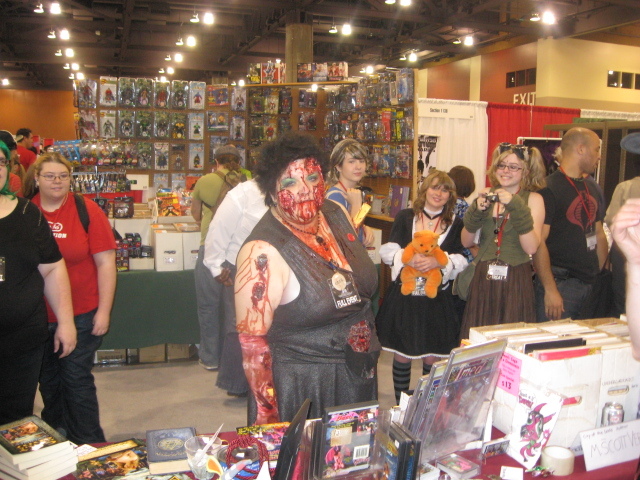 But there sure were a lot of zombies wandering the halls. This one was probably pretty when she was still alive. 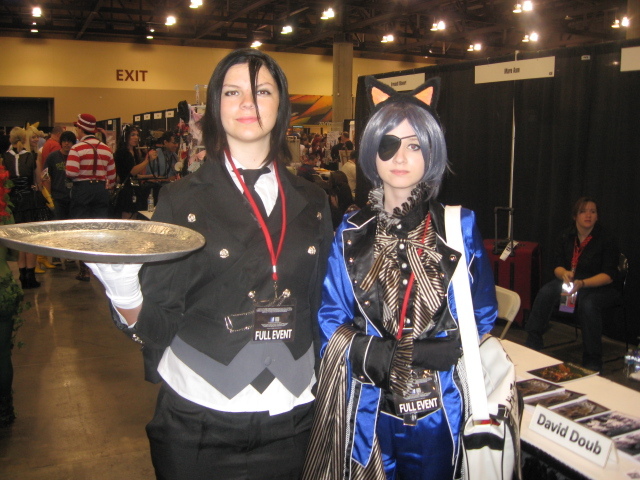 Could this be a demon butler and a one-eyed kid? That's one anime I've totally missed so far. I wonder why this vampire is so blue? 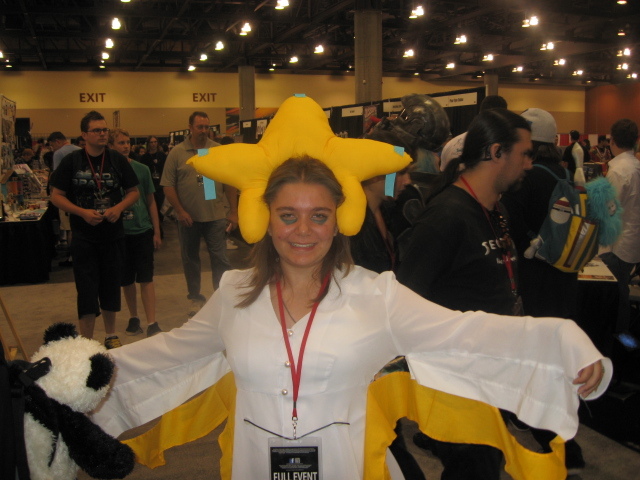 I don't recognize the character, but I love the costume and the smile. She looks like an artist and I wish I knew her. Just a Scottish schoolgirl, but I like her costume. I think this young lady looks like Spider-Man's girlfriend, Mary Jane. I guessed her for a California Girl, and she said she was. 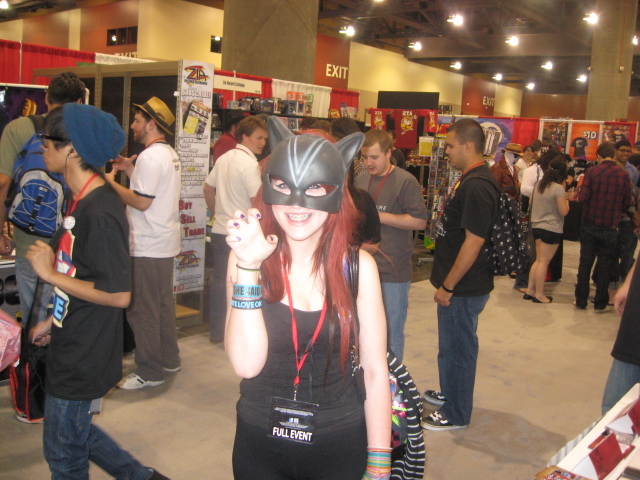 The Arizona Aventers, a service organization of superheroes was at the Con in force. 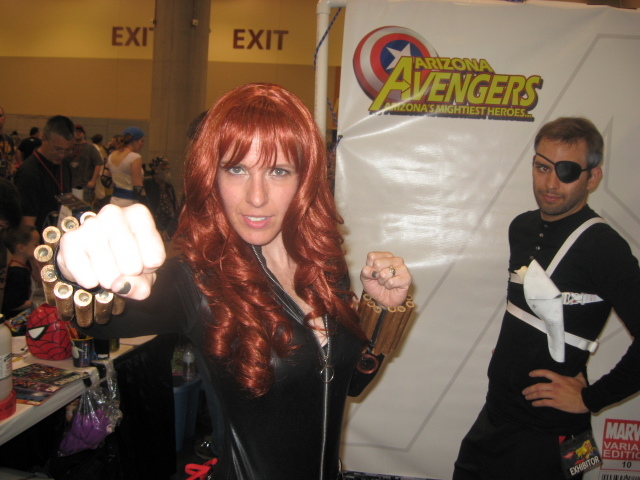 Here we see the Black Widow and Nick Fury. 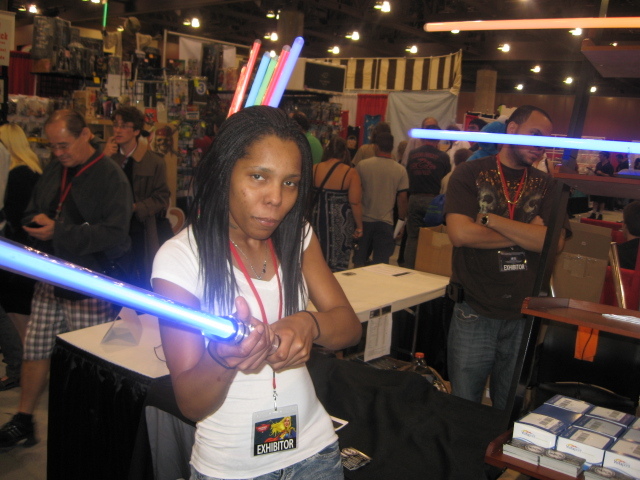 There were light sabers for sale at the Con. This young Jedi looked pretty dangerous to me. 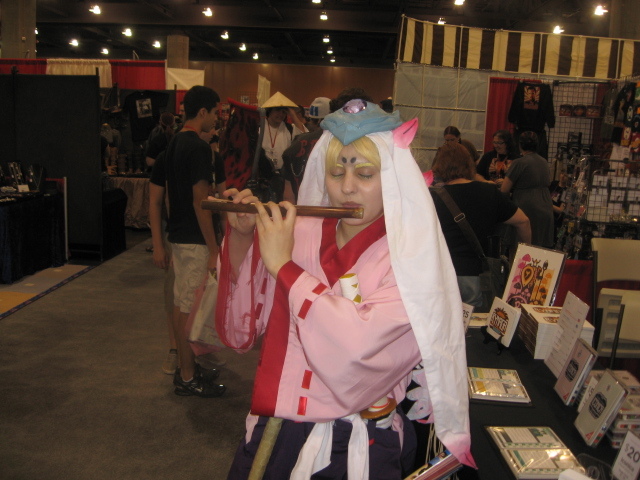 This warrior carried a katana, but won my heart with her flute. 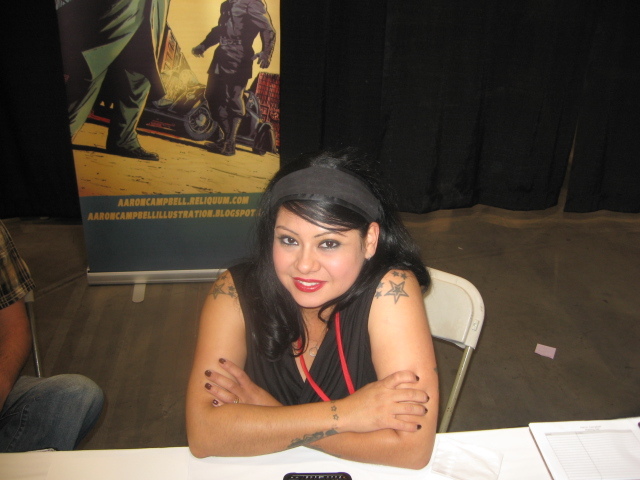 I got a lot of these pictures including this one while hanging out with Steve Crompton at the Carnal Comics booth. Meow! Just friends? Or, partners in crime? Black Swan--I didn't recognize her, since I didn't see the movie. 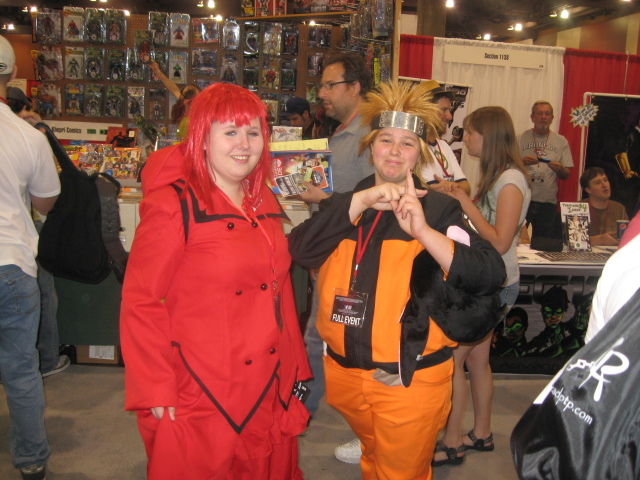 I didn't know that Naruto was a girl! 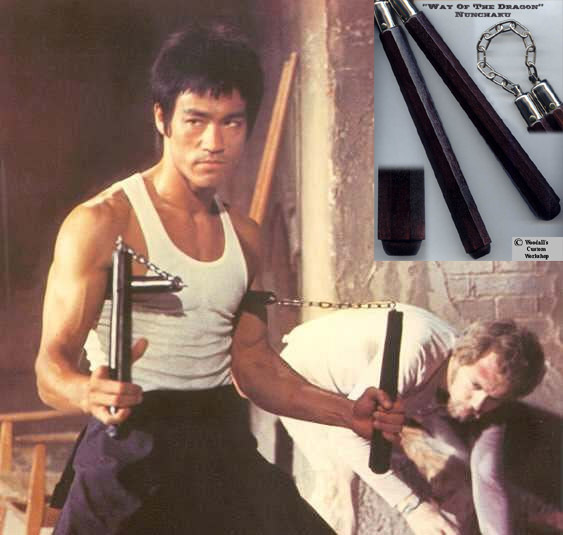 Cool and deadly! Blowing smoke, or blowing a kiss? Sweet in either case. 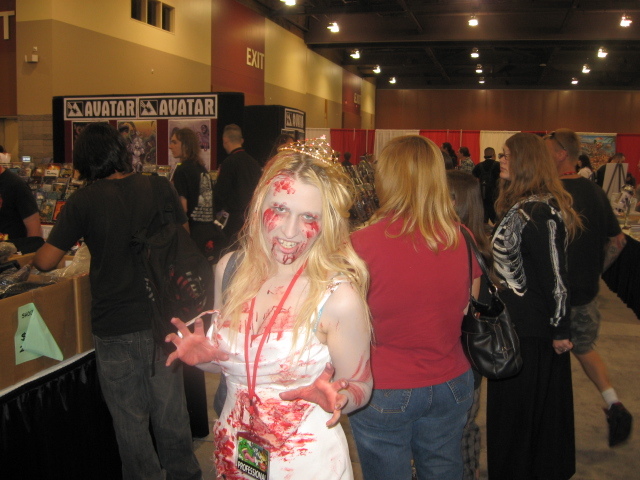 Another zombie girl. Scary! And even scarier fingers! The very acme of zombie cool! If you've got, flaunt it! Would you make passes at these girls in glasses? 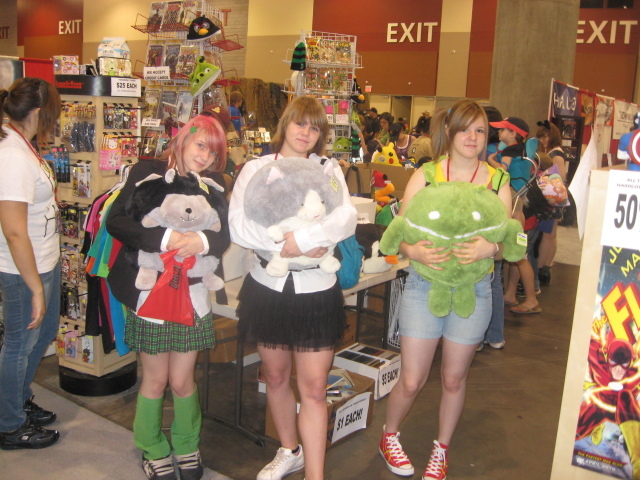 Schoolgirls had some of the best costumes at the Con, and they, more than any other age group, showed up in costume. 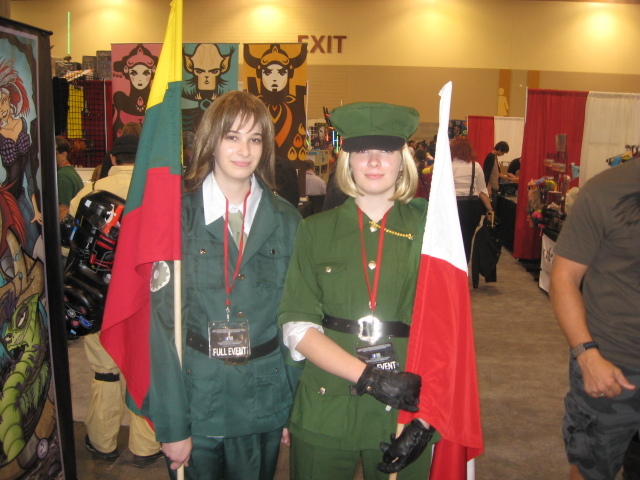 There were quite a few ladies in uniform. My Facebook friend, Cindy, brightened up the gaming area. 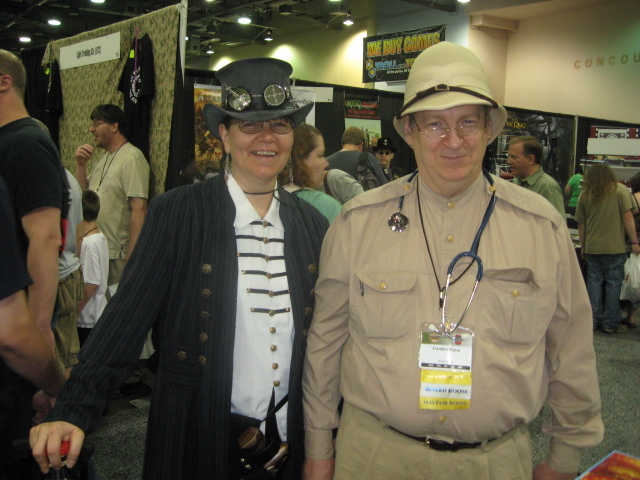 Would you believe that Angie is one of Steve Jackson's Men in Black? She works hard for those MIBs. 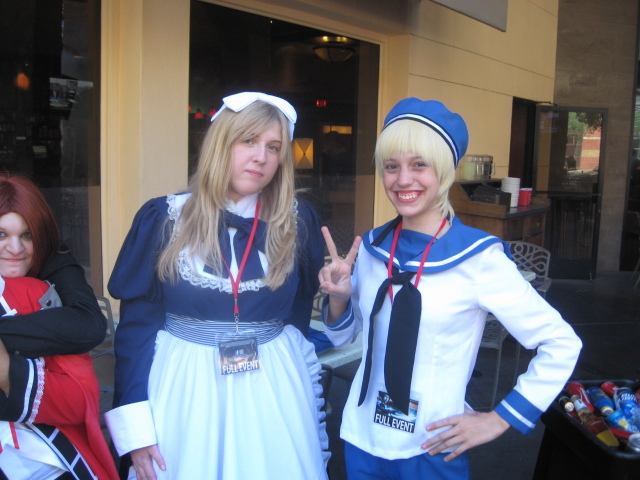 A Sailor and her maid. 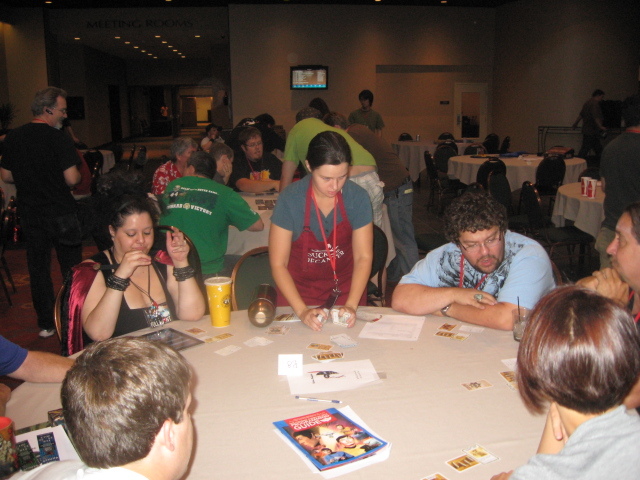 Lady Game Masters presided over many of the gaming tables. 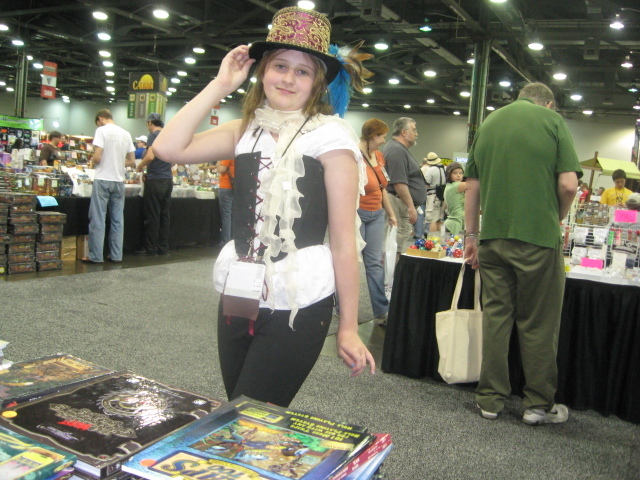 Nola, Queen of Steampunk Costumers, and Lady of the Dark Ones! 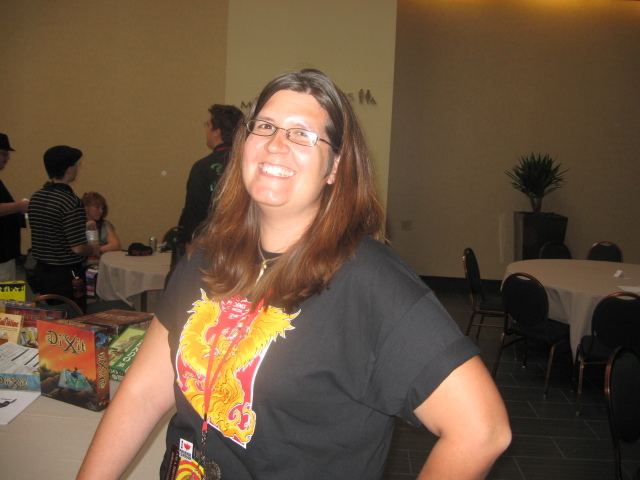 Tiffany Hartwig, Game Coordinator Extraordinaire! 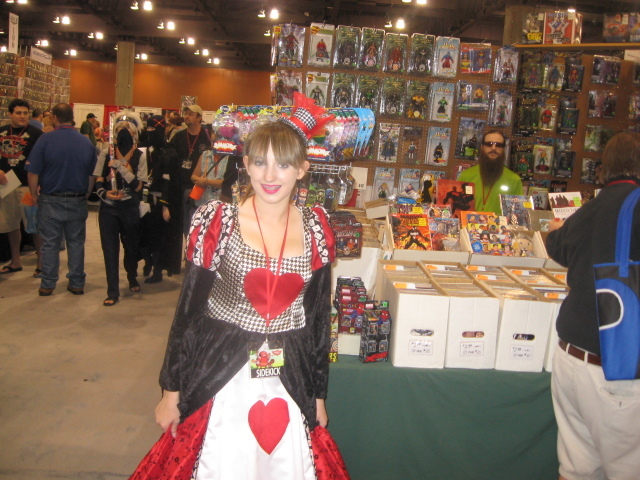 It's the Queen of Hearts! A Wonder Woman if I ever saw one! 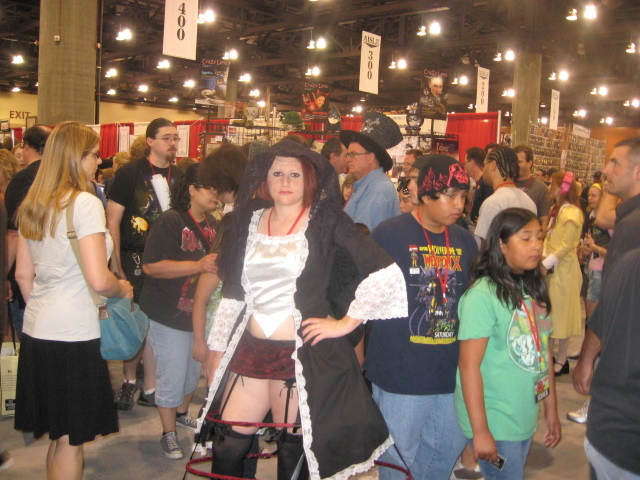 ComiCon was fun for the whole family. 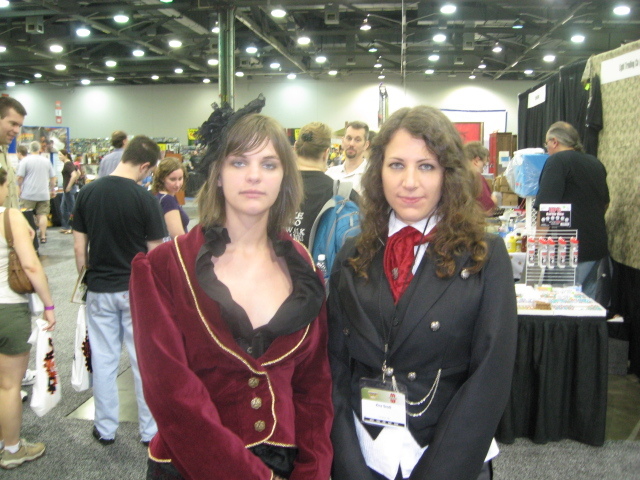 This mother and daughter are elegantly dressed in the occult tradition. Three beauties from the Laughing Moon booth. It's Marvel's Tigra! Another superhuman catgirl, and I loved her dearly back in the 80s. 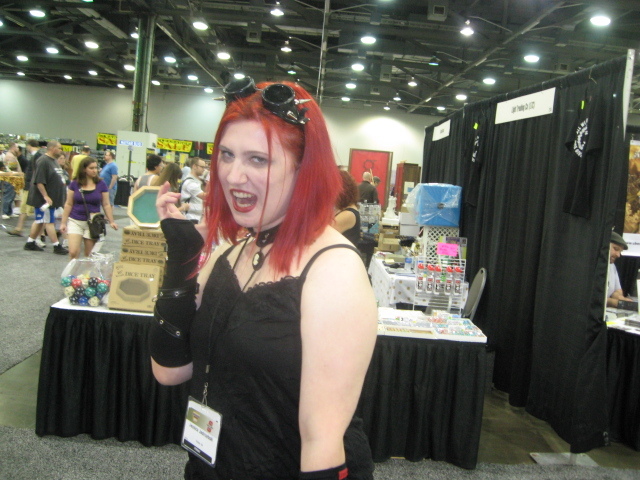 Goth Girlz just want to have fun. 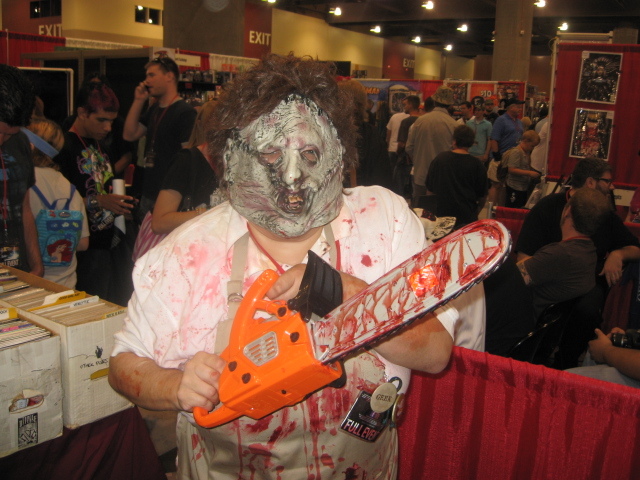 Leatherface--the mother of all calamities! 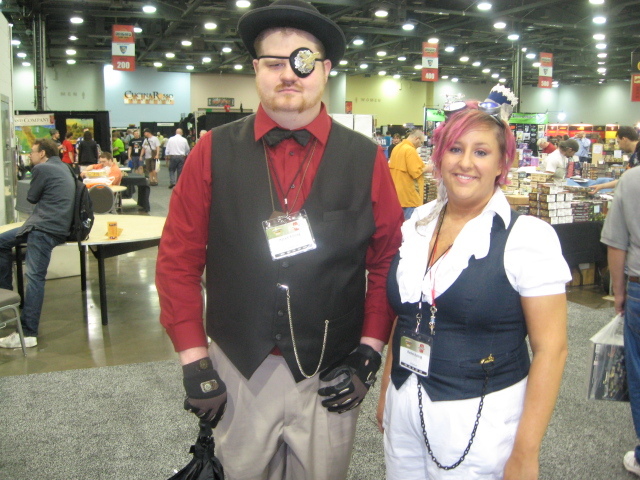 A steampunk lady and her beau. Nazi chicks are the baddest of the bad. And that's good! Alice in Underland. She's late . . . for tea. Big, bad, and beautiful Amazons if I ever saw any. Slave Lea--Jabba the Hutt knew what he was doing. She comes on like a rose . . . but everybody knows . . . she'll really do you in . . . if you let her get under your skin. Poison Ivy! 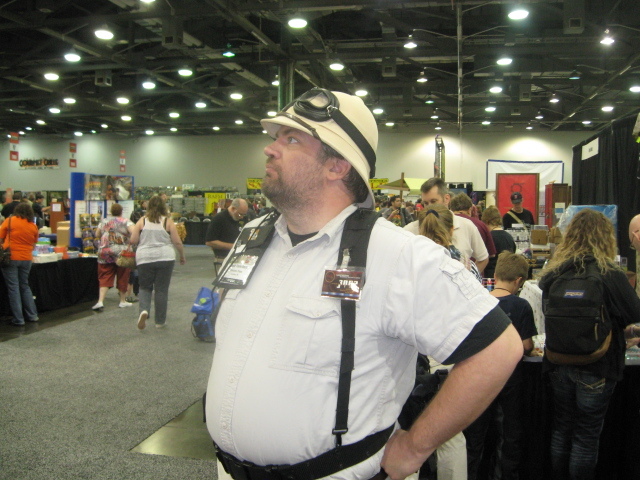 Sell me something, exhibitor! Anything! Albino. I don't think it's Elric. Mature elegance take a break. Snow Queen strides on by. But . . . Sunday I came ready for the fray. 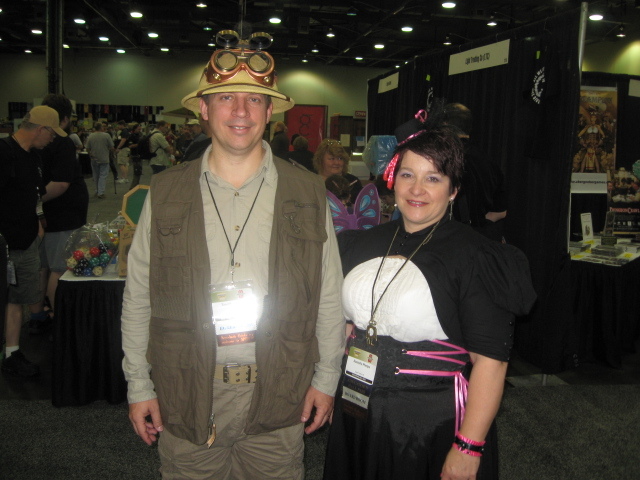 Alas, there weren’t many really great costumes on Sunday, so I have only a few more to add. 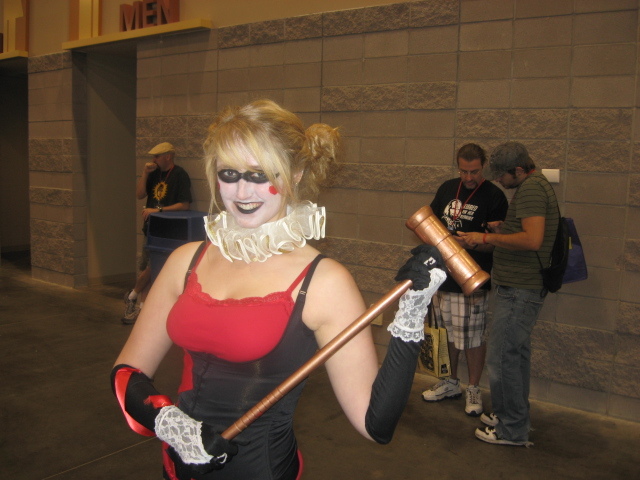 It's another Harley Quinn. 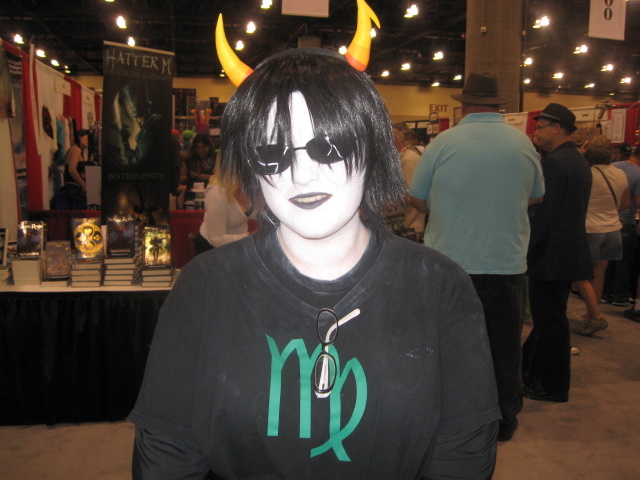 I like her better without the white face paint. 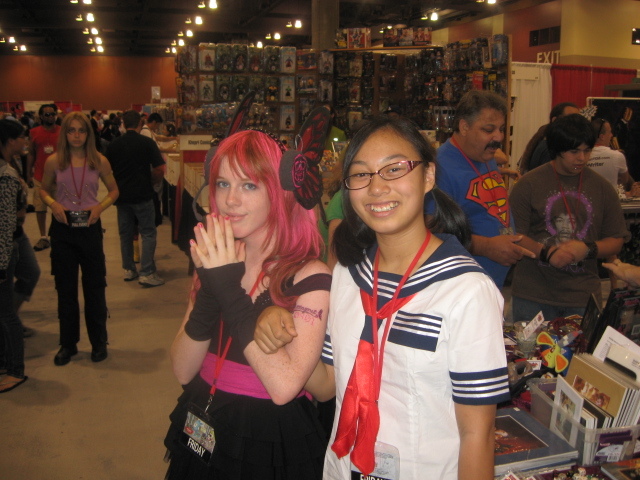 It takes courage to attend a Con dressed as Bomb Girl! It's Elvira, Mistress of the Dark, but it isn't Cassandra Petersen. She's my favorite ghoul friend. Near the end, I met some lovely elfin maidens. 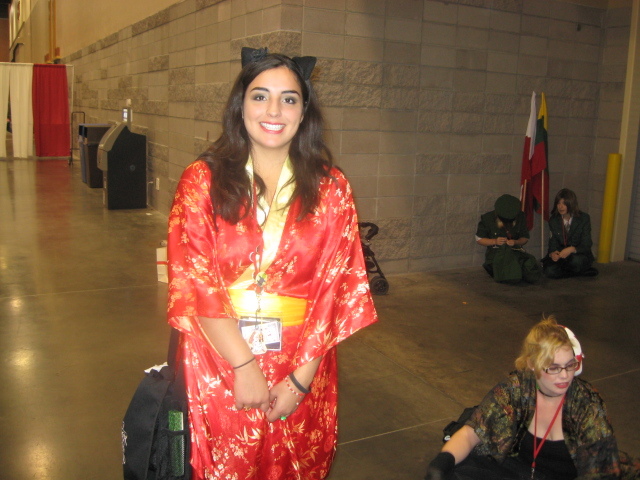 This oriental beauty was my last picture from ComiCon. She was hanging with the elf maids, perhaps to show that human girls are just as beautiful and fantastic as any creature of Faery. 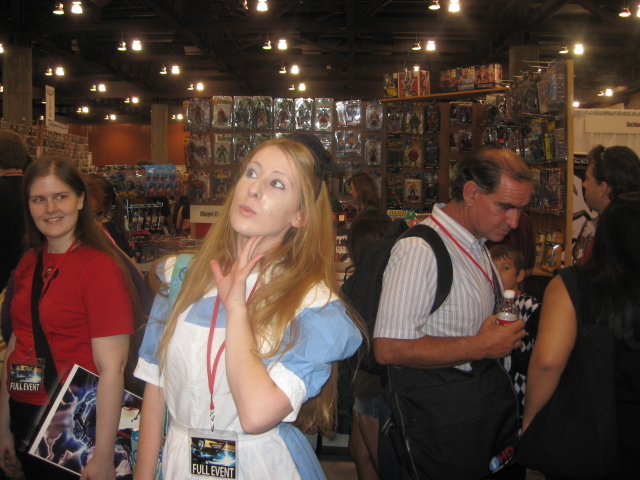 The pictures I managed to take are only a small sampling of the Fabulous Women of ComiCon. They won my heart and excited my admiration, every one of them.